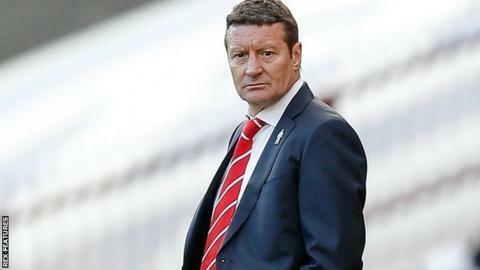 Chesterfield have appointed former Sheffield Wednesday, Sheffield United and Barnsley manager Danny Wilson as their new boss. The 55-year-old replaces Dean Saunders, who was sacked in November after six months in charge at the Proact Stadium. Wilson, who left the Tykes in February, takes over a side 18th in League One, having lost their last six matches. Chesterfield have not disclosed the length of Wilson's contract, but say it extends "beyond the end of the season". Wilson, who spent three years at Chesterfield as a player, told the club website: "I have many fond memories of my time at the club and, after living in the area for over 30 years, it's a club I feel very attached to. "I was asked to have a talk with Dave Allen (chairman) and Chris Turner (chief executive) and just really see how the land was lying - and we got on famously." Wilson was in his second spell in charge at Oakwell until earlier this year after returning in 2013, having led them to the Premiership in 1997. But he was unable to stop them from being relegated out of the Championship in 2013-14 and left the Tykes 17th in League One, seven points clear of the relegation zone and seven off the play-off places. Wilson, who became the 24th person to reach 1,000 games in English football management in December last year, comes in to a side that reached the play-offs last season under Paul Cook. Former Wales international Saunders replaced Cook after he left for League Two Portsmouth, but lost 13 of his 23 games in charge of the Spireites.